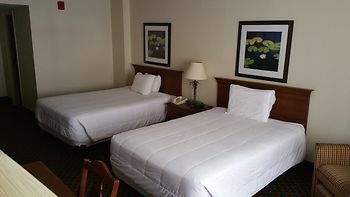 Imperial Swan Hotel & Suites, Lakeland, United States of America - Lowest Rate Guaranteed! Located in Lakeland, Imperial Swan Hotel & Suites is within a 15-minute drive of Lakeside Village and Polk Museum of Art. This hotel is 4.2 mi (6.8 km) from Lakeland Center and 6.4 mi (10.4 km) from Publix Field at Joker Marchant Stadium. Rooms were nice. Price was right. Location great. Old style rooms. Not many TV channels to choose from. No A/C on the 4th floor lobby and halls. 4th floor halls smelled of mold/must. Pillows were terrible, I got a back and neck ache. No breakfast and bar and restaurant were closed permanently. I am being honest, I would stay there most definitely again. If these things were corrected it would be a top notch hotel. Quiet room, a comfortable bed and perfect location for Sun&Fun. The hotel is dated but was still clean and friendly. The hot water in the bathroom sink did not work. Yes. The bath tub drain was plugged. It was very quiet. Beds were comfortable. Location was close to everything. Pillows smelled funny and towels were not the same. For example, one bath towel was large and absorbent, while the second was thin and worn out. The Continental Breakfast is nothing but cereal and muffins. The hotel itself is obviously an old hotel in the process of being updated. Nick was extremely helpful with a great attitude. When I left my camera battery and charger in room he personally found it and return it to me. Very helpful when we had trouble connecting to internet. The cleaning person took our TV controller out of room and couldn't get it back before we had to leave. The head person said she found three in the room next door. Go figure. Why would someone do such a nutty thing?